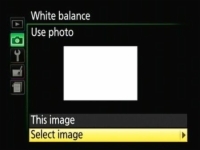 The Nikon D3300 allows you create a preset white balance based on an existing photo. Two words of caution are appropriate. First, basing white balance on an existing photo works only in strictly controlled lighting situations, where the color temperature of the lights is consistent from day to day. Second, if you previously created a preset using the direct measurement option, you wipe out that preset when you base a preset on an existing photo. With those caveats out of the way, follow these steps to create a preset based on a photo. 1Copy the picture that you want to use as the reference photo to your camera memory card, if it isn’t already stored there. You can copy the picture to the card using a card reader and whatever method you usually use to transfer files from one drive to another. Assuming that you’re using the default folder names, copy the file to the 100D3300 folder, inside the main DCIM folder. 2Open the Shooting menu, highlight White Balance. 3Select PRE Preset Manual, as shown on the left in Figure, and press the Multi Selector right. The screen shown on the right in this figure appears. 4Highlight Use Photo and press the Multi Selector right. You see the options shown in the figure. If you haven’t yet used the photo option to store a preset, you see an empty white box in the middle of the screen, as shown in the figure. If you previously created a preset, the thumbnail for that reference image appears instead. 5Select the photo you want to use. Highlight the photo you want to use as the basis for the preset and press OK to return to the screen shown in the figure. Your selected photo appears on the screen. 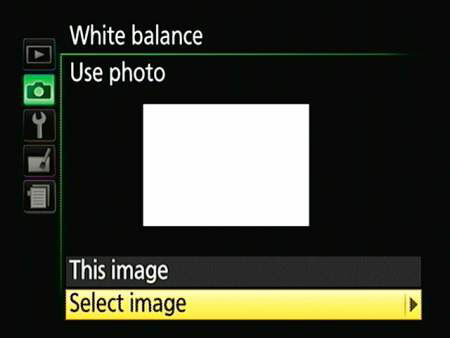 6Highlight This Image and press OK to set the preset white balance based on the selected photo. Highlight Select Image and press the Multi Selector right to choose the image that you want to use as the basis for your preset.